David Hunt Lighting British made Doreen medium sized 9 light chandelier features a contemporary central baluster that is crafted from a series of cone shaped structures that are decoratively ridged and co-ordinate with the matching lamp holders. The frame supports two tiers of deeply curved arms for a look reminiscent of picturesque, Flemish style fixtures, and is complete with an elegant pewter finish. The product code for this David Hunt chandelier is DOR1399. Shown with 100% silk shades in a Linen Grey colour, however David Hunt have a variety of shades available in 12 silk colours, with a choice of a white laminate or gold, silver and bronze metallic linings. Be bold and daring with this original, meticulously hand-crafted chandelier from David Hunt Lighting. It accents homes with the intimate ambience created by its warm hues, elegant contours and subtly decorative details. Height is adjustable prior to installation only. 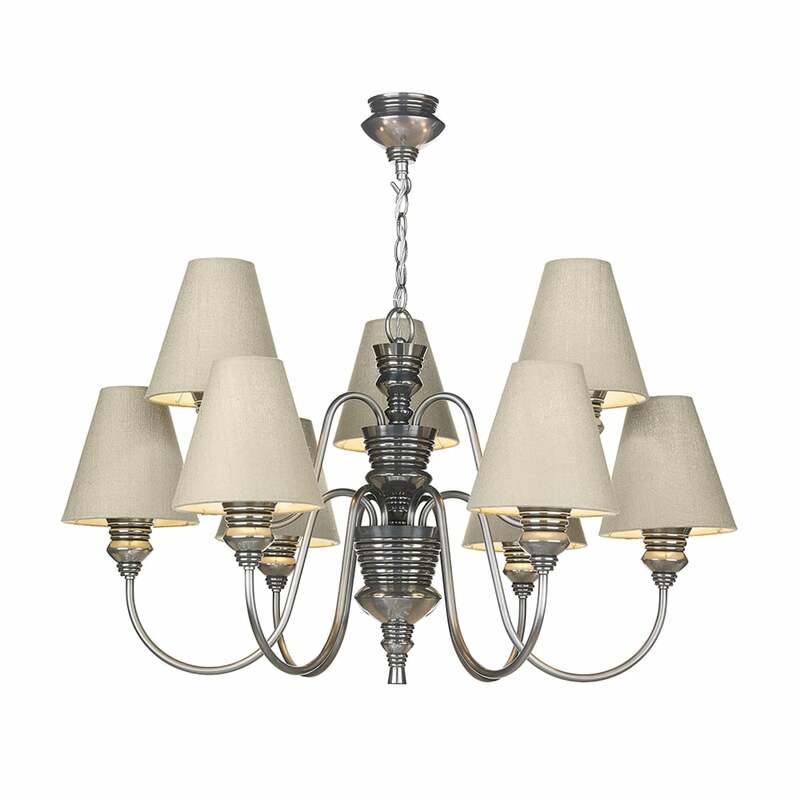 This impressive range is also available to order as larger 15 and smaller 5 light chandeliers and a 2 light wall fixture. Alternative shade options and a beautiful bronze finish are also available to order by contacting our sales team or by continuing to browse through our website.